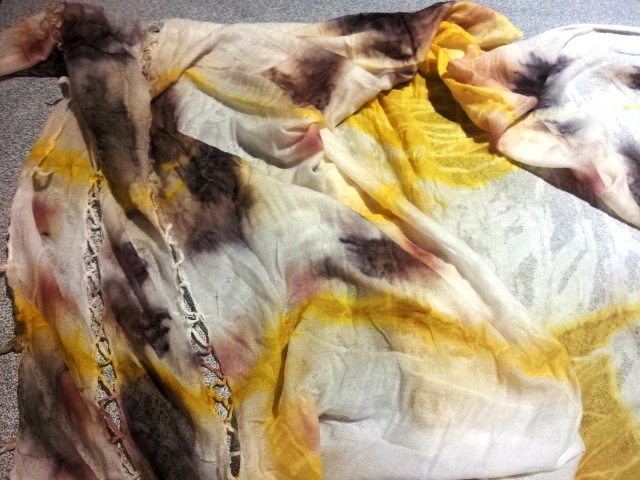 A few days ago, I experimented dyeing an old tee shirt and cotton scarf which had not been mordanted, but had been washed. 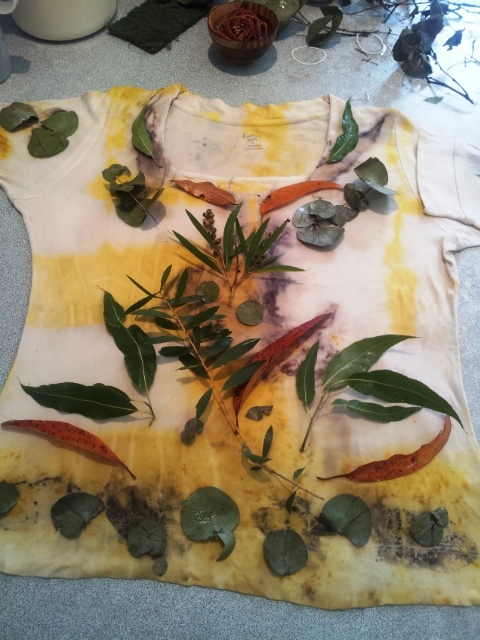 I used turmeric and paprika powders from my cupboard and eco-printed with Eucalyptus cinerea leaves dipped in iron water. 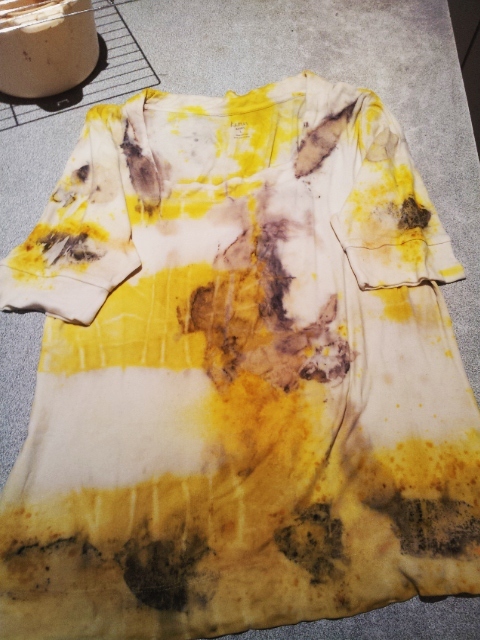 After boiling for 2 hours the result was bright yellow turmeric areas, with smudgy black leafy areas. I dried them but wasn’t really happy with them. I just don’t like the colours! They’re too garish. I didn’t really think it through but just grabbed what I had in the pantry! Undeterred, and not liking to waste a good under-painting, I washed them and dipped in milk/water mordant then dried again. Today after dipping in water/milk again, I laid out a heap of Eucalyptus leaves from my garden and Eucalyptus cinerea that had been soaking in water with a bit of vinegar. Then they got bundled up and as I write they’re still boiling in a bath of water stocked with more eucalyptus leaves and bark. There was space in the top of the pot to place an upturned colander, so I bundled up some more paper and leaves (just Eucalyptus leaves this time) and stashed them on there. I covered the pot with al-foil, and secured it with string to keep the steam in. 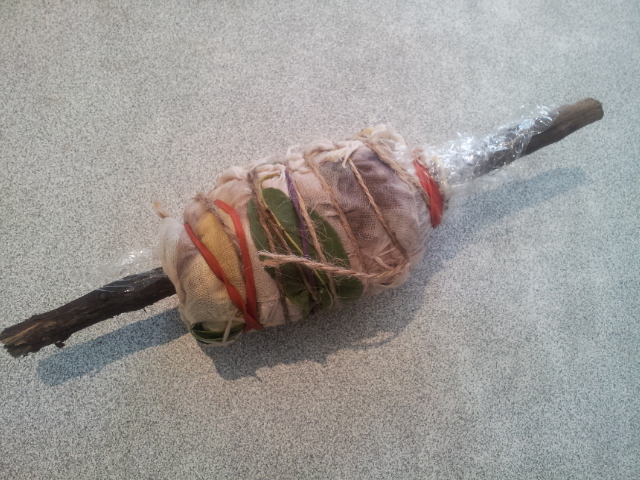 After a couple of hours or so, I’ll take them all out and leave the cloth as long as I can before opening them. Good luck with that Madame Impatience! Okay, my website didn’t talk to me. But it came to mind and, wanting to continue from my other article, eager to put more thoughts ‘out there’, I grabbed my laptop, hosed down the plastic recliner outside, and headed for a shady spot in the front garden. Ignoring the occasional fly and enjoying the bleats of the neighbours’ sheep, I set about the business of writing. Interestingly, when I typed this, I transposed the letters for ‘begin’ and typed ‘being’. And while I corrected the spelling mistake, it did occur to me that I’d inadvertently typed a part of the answer. (And I know ‘part’ also spells ‘prat’, but that’s got nothing to do with anything here, okay). You see, being – being you – your SELF – is basically all you have to do. 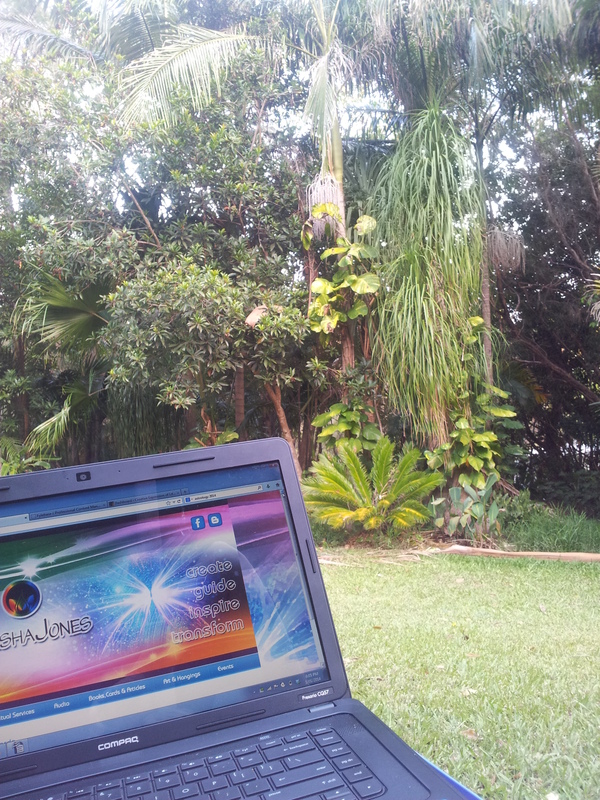 I must say though, it has been a great start to 2014 – taking the initiative and bringing my ‘office’ out here into my garden overlooking our little rainforest. I nearly stayed inside. I am so glad I followed my heart and stepped out of my comfort zone long enough to hose down the chair and create my own little creative niche. Nice to see I’m getting back into walking my talk again! Let me end today’s post by wishing you a wonderful 2014 and may positive change come gracefully and creatively in line with your heart’s desires. Love Poppies! – Nuno felt scarf! One end of poppy scarf. Lots of silk hankies. Closeup of one end of poppy scarf showing poppy field. 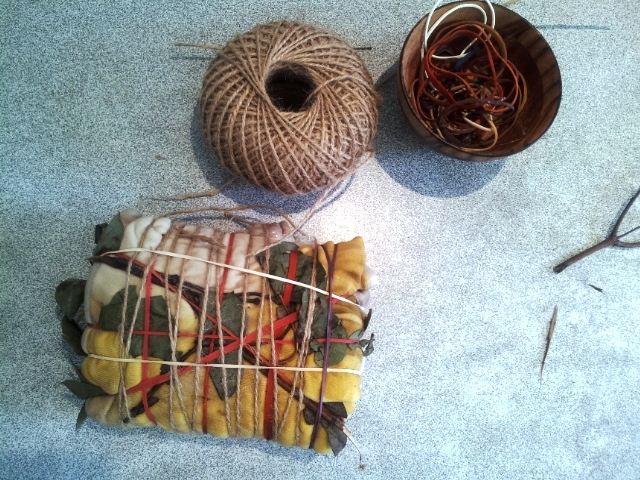 Merino, tissue silk, silk noile, variegated yarn. Here’s a lovely lightweight scarf I have just made. I couldn’t leave the poppies until I had used the theme on at least one other item. Changing my style slightly, although still keeping the scarf as fine as possible and using the wool mainly to ‘stick’ silk to silk, I laid one end of the scarf out showing a poppy field, and the other with three large poppy heads. This will be on display over the weekend as well. 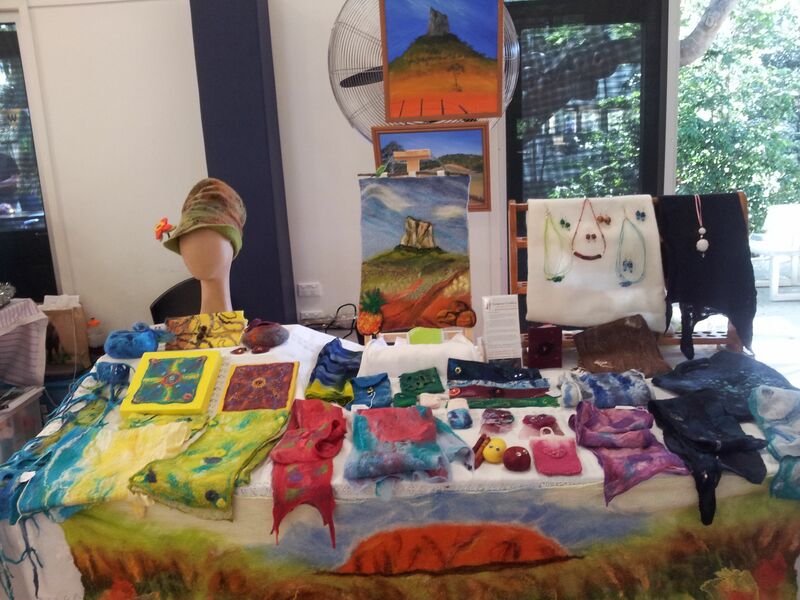 This is a quick post to show a couple of pics of a limited variety of my felting that is on display at Beerwah Library for two weeks. It is lovely to have the opportunity to display my work locally. I am a member of the Glasshouse Country Arts Trail and we have several weeks available to display members’ works. Ilia Starkovsky is also displaying some of his photographic art, and Bronwyn Hill and/or Melanie Gray Augustin will also be bringing showing some of their work this fortnight. To view a lot of my felt work in one ‘hit’, check out the Gallery – Felt which I have just updated with more recent pieces. Beach Wall hanging is finished! At last, after showing you the felted first stage of my latest wall hanging, I’ve worked on it and now (apart from putting a backing onto it), it is finished and I thought I’d share a bit of the process for anyone interested. The colours are actually brighter in real life than in this photo, and I’m very pleased how it has turned out. I don’t know if you’ve ever had a “Can I do this?” moment, but after feeling very pleased with how my Mt. Coonowrin wall hanging turned out, I began this project with more than a little trepidation. Madame Doubt kept whispering “was the first wall hanging a one-off?”, “will I stuff up this next one?” in my ear and it took several weeks before I got up courage to begin, and lay the first tufts of blue sky. Once it had been wet-felted though, I was happy that I have got a bit of a knack to doing this, and despite having to shave the bottom half of the project, could see in my mind’s eye how I would complete this work. 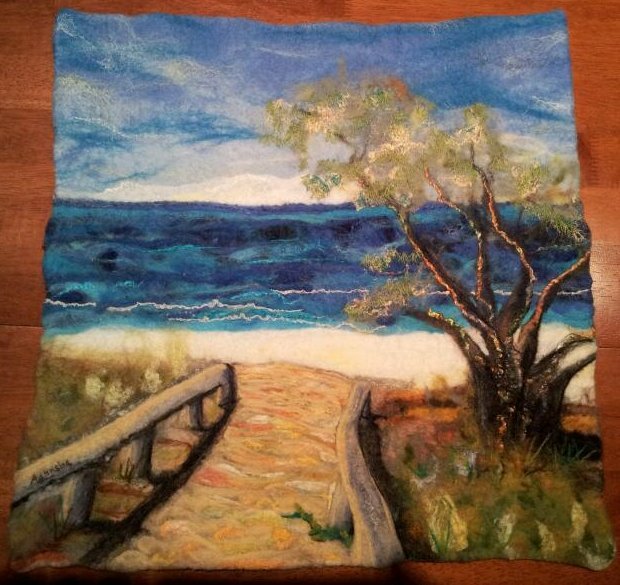 I needle felted a lot of detail, including fixing up shadows, adding silk noil to the sandy walkway, and grass details. Toe make the She Oak trees look more realistic, I embroidered leaves on top of the felted leaf colour, which I think adds depth. 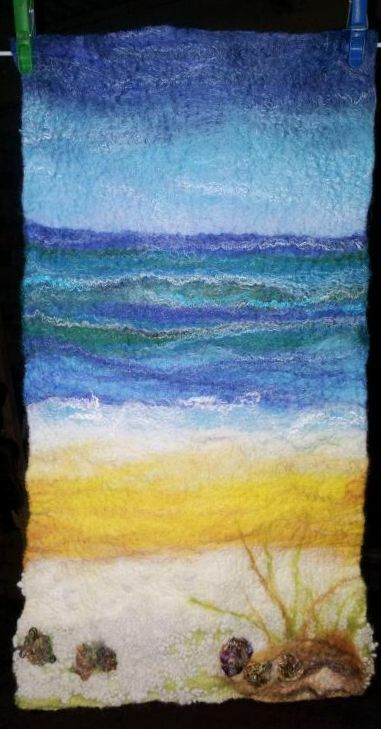 I didn’t like how the yarn had felted into the sea. It had started off with a lot of blue in the variegated colours, but after wet felting, all I could see was maroon. I spent time needle felting over these threads with various shades of blue wool and also turquoise silk tops. Much better. The waves were added by needle felting thin pieces of selvedge edges from tissue silk that I cut off before making scarves. By cutting off these denser edges, it ensures the wool rovings migrate right through the edge of the scarves. Plus I get to use the selvedge edges for other projects, like the waves in this picture. It is delicate enough to give that bubbly frothy white caps that form on the tops of waves as they approach the beach. To finish, here’s a collage of pics, working up to the finished piece. My next two are going to be smaller, longer thinner wall hangings – abstract in design but reflecting beach colours, and perhaps shells. I would like to acknowledge Gusha Visual Media who have inspired my latest work with some of their photos of the Sunshine Coast. In particular, Moffat Beach, which is so beautiful, I wanted to try and capture the scene in felt. I had a lovely day at the Glasshouse Markets today: friendly atmosphere, warm company, good coffee and tasty brownies. At the market today, I said goodbye to most of my felt scarf ‘babies’ who all went to good homes. Thank you ladies for finding the scarves that were meant for you – some of them are travelling as far as Melbourne and also New Zealand! Market Stall, Art Exhibition and Auction … and Arts Trail all in October! We’re all starting to get excited about the Glasshouse Country Festival that is being held in October. There will be a twilight Glasshouse Market on Friday the 18th October. Also as part of the festival, the Glasshouse Country Arts Trail that I belong to is having an art exhibition over the weekend 19th/20th October, with an art auction on the Saturday evening. Immediately following this weekend for two weeks, the members of the Arts Trail will have our open studios, so anyone interested can come and see our work and meet the artists in person. I have also been asked to run a fun felting workshop for the local primary school children. I’ve got my work cut out for me now! 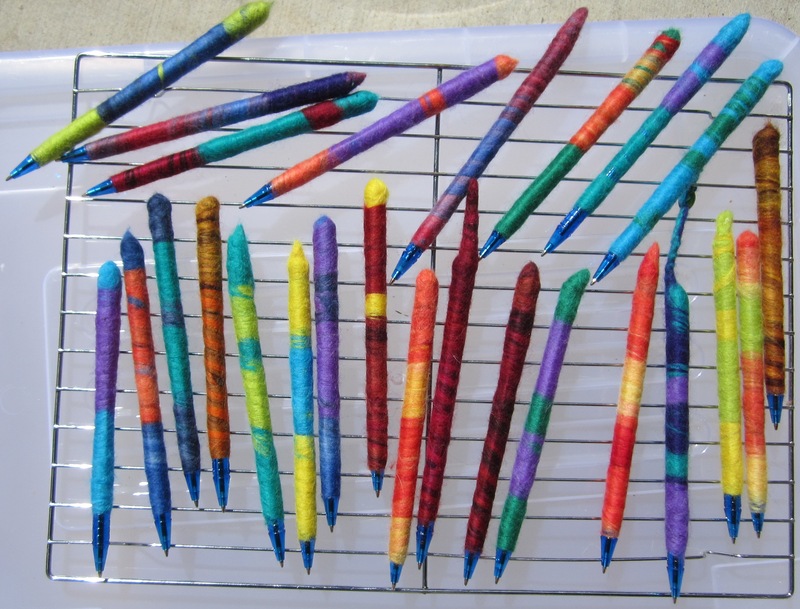 Real ‘felt pens’ drying – pens, felted with wool. During the first Open Studio weekend I made a small piece of felt to demonstrate the wet felting technique for four lovely ladies who had come along to Sandra Price’s studio where I was fortunate enough to show my felt art alongside her beautiful and colourful artwork. Last week, Sandy let me know that a couple of these ladies were interested in making a nuno felt scarf, so I surprised myself by being very proactive and organised a workshop for Saturday the 3rd of August. I have all the information at my other website, including what you receive in your Funtastic Felt Pack which you use during the workshop and which you also get to take home so you are all set to make another piece of felt if you wish. If you can’t make the 3rd August but would love to learn to make a beautiful lightweight nuno felt scarf, contact me and I’ll put you into another workshop. Technicolour Dream Felt Glasses Case! I took the square of felt I made at the open studio on Sunday and turned it into the most beautiful Technicolour Dream Felt Glasses Case I’ve made ever! Well, I think so. Instead of folding it with two creases to make a traditional case shape with flap, the pattern of the material suggested more of an ice cream cone shape. Using a multi-shaded cotton thread in greens and aquas, I used a running stitch to sew it together. First of all I secured the inner fold with ‘invisible’ sewing – I love felt as it is very forgiving and you can hide stitches in the thickness and multi-colouring. I didn’t sew all the way to the top of the case, but left about 2.5cm open so you can see the inner fold as well. I reinforced the top stitch a few times so it’s strong enough for wear and tear… off and on, in and out … I use my specs a lot! I continued the running stitch to the top of the front flap, and finished it off as a spiral, bringing the stitching together with the circles theme of the silk and wool inlays. In response to a comment in the post “Conflicted but Creative”, I decided to share this vision I had when I was a young girl. In order to save time, I’ve taken the liberty of copying this directly from an old website of mine, with minor editing. In my mind I was shown three snapshot aspects of a developing humanity, and each one ran from left to right along a timeline. I saw this person being born, growing through childhood, adolescence, adulthood and then into the senior years until dying at an old age. This human started as a ‘blank’ slate, curious, learning, seeking information, looking within and becoming wiser with age. This picture began with an ape-man, becoming Neanderthal, going through the Stone and Iron Ages, progressing right through the Middle Ages to the Industrial Age, to the Information and Space Age where we are now and then continuing to evolve far beyond, becoming competent and wise, not just technologically, but also with compassion for all humans and other beings on the planet. These wise beings were accepted into a universal family, as our descendants interacted with other wise beings from planets beyond our solar system. It began with a tiny spark of life emerging from the Universal Life-force Energy. This spark dipped in and out of different lives and lifetimes. It experienced itself through the eyes and emotions of men, women and children through all walks of life, poor and rich, ignorant and sagacious, from ape-man to Universal human. And with every lifetime, this bright spark grew in intensity and size, becoming more loving, more knowing and more joyful, more vibrant and more complete. This timeline, along with the second, was not restricted by the span of one life. Nor was it restricted by time or space. This timeline put the other two into perspective. When I was an eight year old girl, I just accepted this without question. Later, as an adult, I recalled it with the tingling excitement of someone who recognises a glimpse of a universal truth. That vision was so clear that I can view it instantly today. Today, it speaks to me of evolution, of our incredible ability as individuals, as souls and as a united humanity to grow beyond the limitations that have held us back up until now. It speaks of greatness and adventure – the qualities and experiences only to be found by stepping forward in humility, joining hands with each other and with our true essence. To me it shows our true potential if we accept our birthright as ‘divine-potential’ humans. Humans who are much more than we have been taught we are and are connected to each other and all of creation by a loving, wise, joy-filled energy. If we look at our lives with our hearts, as well as our heads and are discerning rather than judging and creative ‘out of the box’ thinking, we will be more easily able to settle our differences within ourselves and with others, and find a life of peace. If we give, rather than take, we will find the abundance that is always present. If we come from our inner truth, rather than doing what we think others would have us do, then we become truly happy and leave blame behind us. The outcome of this journey is not assured – we are facing a complex world of problems and seem to be at odds with each other in so many ways. However, I have a sense that we will be able to turn things around – maybe not all of us – but in some way, as we reach with courage for new solutions, the old problems will fall away and perhaps remain only in our memories as a distant bad dream. I used to think that meditation and the power of positive thinking were all that were needed. These days, after living life more of my life and looking at it post menopause, I know that we need more. We need body centred consciousness as well because the body is the place where we are able to perceive/sense what is happening at a visceral level that is both grounded and immediate. The vacillations that come from trying to use our heads alone to solve our problems are much less of a problem when we listen to our gut instincts and physically sense what is true, or the correct next step for us. I won’t spend any more time writing my thoughts here, but will leave this as a memory jogger, or inspiration, or thought-provoking post. I’d be happy to receive your comments.